In this edition, we examine recent events that may explain bitcoin’s rather extraordinary drop in price over the last month. We recap what “block size” means, why it is at the center of a contentious debate, and which approaches towards improvement of the bitcoin protocol are most likely to take place. We explain how the takedown of darknet market AlphaBay wasn’t an exit scam after all, and take a peek inside the secretive bitcoin mines of the Wild East. In case you didn’t know, a “block” is a chunk of data that includes bitcoin transactions over a ten-minute period. Each new block is successfully added to the blockchain by a miner, who is then rewarded with a certain number of bitcoins. The problem is, each block is only 1 MB in size, and while the average bitcoin transaction is quite small in terms of data, only so many transactions will be able to fit into a single block. So which transactions get added to the block first? Obviously, it’s the ones with the highest transaction fees, which the miners then collect as an additional reward upon adding a block to the chain. The average MB size per block remains less than the 1 MB max of transaction data that is currently allowable, with a size of about 0.83 MB (as of the writing of this article). If bitcoin continues to attract a larger user base in its current form, the average block size will undoubtedly approach the max of 1 MB, and bitcoin will continue to experience ever-growing transaction fees. 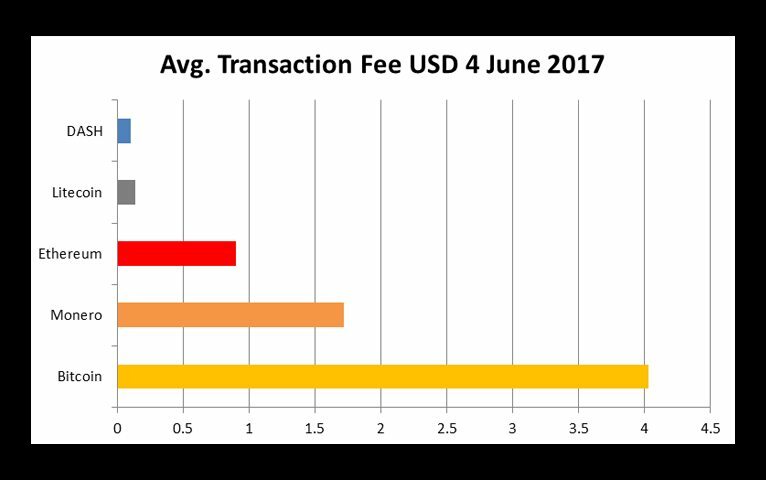 Only those willing to shell out the highest fees will have their transactions included in the next 10-minute block. Everybody else will have to fall to the wayside, waiting 30–180 minutes, or longer, to have their transaction confirmed by a miner. This inherent impairment of the bitcoin system was noted by Satoshi Nakamoto himself, with the general community consensus of developers at the time interpreting Nakamoto’s words as open to the idea of a change in block size in order to “scale,” or compete with big-time payment processors like PayPal and VISA. While Satoshi’s words are beset in an encapsulated time period – in the good old days when a $0.00 mining fee was the norm – his openness to the idea of an increased block size in the future is readily apparent. 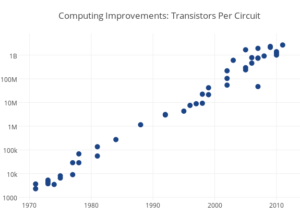 One thing Nakamoto couldn’t predict at the time was that Moore’s Law – upheld since its observation by Intel co-founder Gordon Moore in 1965 – would eventually cease to be a law. The physics behind the minutiae of the ever-shrinking circuits that power today’s most advanced computational hardware makes maintaining Moore’s assertion that the number of transistors per computer chip would double every 12 months a physical impossibility. Nakamoto did or could not foresee this limitation, and thus scalability remains a potentially show-stopping problem for the continued survival of his original creation. Critics argue that opening the gates to bigger blocks will only increase the problem of “blockchain bloat,” as the bitcoin blockchain now exceeds 120 GB in size. This makes the possibility of running a full node out-of-reach to an overwhelming percentage of the world’s population. If the clear majority of bitcoin users are forced to rely on only a handful of nodes and miners to carry the blockchain and add new blocks, bitcoin stands a much higher chance of losing its principle element of decentralization. This is a bad thing, because ultimately bitcoin goes from a community-driven movement to an oligarch-driven movement, where the nodes and the miners have an inordinate amount of sway over the control of bitcoin. If giant-size mining pools merge together, or simply make agreements with one another, they could decide to only include transactions into their blocks with giant-size fees, say, $4 or more. If this kind of under-the-table mining consortia ends up mining the majority of incoming blocks, that means your chances of getting a transaction added within the next 10-30 minutes is slim, unless you’re willing to pay the $4 miner fee. There is no universe in which SegWit will not get activated. – Anonymous bitcoin developer. In previous editions we highlighted Bitcoin Unlimited (BU), its prospects of success, and its competition. The idea of a hard fork, or the split of bitcoin into two separate chains (with one remaining as bitcoin and the other as Bitcoin Unlimited), has turned out to be a major turnoff, not only among much of the community but to major investors as well. Though profit-taking is undoubtedly part of the reasoning behind bitcoin’s recent sell-off, investor fears and confusion over the future of bitcoin are most likely also contributing to a price drop of almost $1,000 in 1 months’ time. The Segregated Witness (SegWit) bitcoin protocol, also described in previous Roundup additions, rose up in popularity among miners to challenge BU by introducing a way to “soft fork” bitcoin instead of having to split it into two different, competing chains. It does this by not only removing extraneous transaction data not entirely necessary to a bitcoin transaction but also by giving miners the ability to set independent sizes of their own blocks, ranging from 1-4 MB. The major difference between a hard fork and a soft fork is that soft forks are backwards compatible, meaning they do not require a change in wallet or mining software in order to accept SegWit’s integration into the network. Miners that do not upgrade the new SegWit protocol will still be forced to mine 1 MB blocks, while also competing with miners whose blocks may be much larger in size. With blocks mined hovering around 87%, it seems likely that a modified version of SegWit, SegWit2x, will surpass the 80% miner support signaling that must take place for SegWit2x to become activated on the bitcoin network. Like its predecessor, SegWit2x implements the transaction data reduction method of Segregated Witness while also assuring there be a block size increase to 2 MB within six months of implementation. Such an increase will likely once again raise concerns of a hard fork, but at the speed at which alternative cryptos are developing, we may not care as much about bitcoin in 2018. It turns out the shutdown of the infamous, #1 darknet market AlphaBay, wasn’t due to an exit scam after all, but a multi-government takedown involving American, Canadian and Thai federal governments. The story took an even more dramatic turn when the imprisoned administrator of AlphaBay was found hanged to death in his Thai jail cell. It is likely that the 26-year old Canadian Alexandre Cazes, who was facing extradition charges to the United States took his own life, rather than having to testify in court about his operations. These photos of Chinese bitcoin mines give you the feeling they are actual mines. Far from society, often kept in undisclosed locations and devouring untold kilowatts of cheap fossil fuel, these giant warehouses filled with intricately-wired computer servers and mining equipment are often located in cold, windy valleys or elevated plateaus to minimize cooling costs. Though conditions depicted in the photos often look unsanitary, operations are profitable enough to remain in business, seemingly without much worry. Now even the security-centric, renowned developers at LINUX are getting into the blockchain space, recently unveiling plans for a business software building system known as HyperLedger. Their system promises a high degree of security and user-friendliness, allowing businesses to easily develop custom applications to interface with the open-sourced Fabric 1.0 system that powers the HyperLedger blockchain. With a huge list of worldwide corporations already on board with the project, the future of HyperLedger looks bright, given it is sealed with the LINUX stamp of approval.